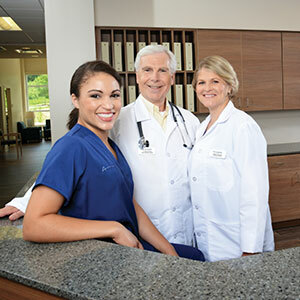 We want our patients to be as comfortable as possible while at Salude. Therefore, please feel free to bring the following items to the facility. We recommend leaving any valuables at home, and it is best to label all items with your name. If you have any questions or concerns, please ask a member of our staff. Salude will provide generic toiletries in your suite (hair dryer, toothpaste, mouthwash, razors, deodorant, soap, shampoo, etc.). However, you may elect to bring personal products of your choice. The employees and management team of Salude want to make your stay comfortable and ensure you have a speedy recovery. When you arrive, you will be assisted to your suite. A nurse or nursing assistant will visit you in your suite to aid with any immediate needs and provide a general orientation of your suite and of the facility. The nursing admission assessment will be completed on your first day of admission. Your medications, based on orders received from the hospital, will be ordered from the pharmacy. If you arrive prior to 4:00 pm, you will be evaluated by the therapy department that day. If you arrive after 4:00 pm, your therapy evaluation will take place the next day. Other team members will also visit you within 24 hours of admission. A lunch and dinner tray will be delivered to your suite during regular meal times. If you would like a snack before the meal arrives, please let our staff know. At Salude, we have three primary care physician groups that will see you if your primary care physician does not make visits to our facility. One of our primary physician groups will be assigned to you and see you after you are admitted to Salude. Our CEO and medical director at Salude is a full-time physician “transitionist” with hospital experience, and he helps assure that our care delivery and quality protocols are in place. Additionally, we have nurse practitioners, a physiatrist (rehabilitation physician) and an infectious disease physician on staff. Finally, at the time of discharge, you may have the option to have our nurse practitioner team perform home visits. We will have an interdisciplinary bedside meeting/rounds with you within the first few days. Family members are encouraged to participate. This occurs after initial assessments by our team members to discuss your plan of care with the interdisciplinary team. Additional meetings can be held to review progress as necessary. We will also strive for a safe discharge and can meet with you and your family to plan your transition from the facility if needed. You and your family will communicate with the interdisciplinary team and discuss needed equipment, home or placement issues, upcoming appointments, medication needs and home health services. We can arrange transportation for you should you need assistance going to a doctor’s appointment. We can schedule a wheelchair or stretcher transport, and there is a cost associated with the service that is not covered under Medicare and most insurance plans. 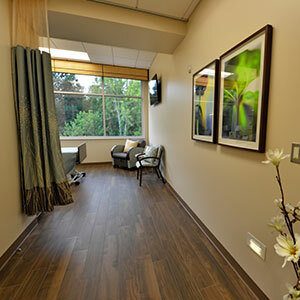 While at Salude, you will be able to coordinate your therapy sessions depending on the time of day you function best. One of our therapists will consult with you to provide more information about the equipment used, what tasks will be done and how to schedule your appointments. We offer physical, occupational and speech therapy. Physical and occupational therapy is provided seven days a week to allow you to return home as soon as possible. Speech therapy is provided five days a week and will provide evaluation and treatment as needed in the areas of swallowing impairments, voice and language and cognitive therapy. We provide housekeeping services every day from 8am-7pm. We clean the suites daily, but if you need extra cleaning or have any questions, comments or concerns, please call the front desk at extension 3222 to contact a housekeeping supervisor. When a patient leaves the hospital and comes to Salude, the physician at the hospital sends medication orders with the patient. Once the patient arrives at Salude with their medication orders, the orders are reviewed by a nurse, a physician and a pharmacist. This ensures the accuracy and appropriateness of each medication. Medication cannot be given to a patient until the orders have been through this safety process, so medications may not be immediately available upon the patient’s arrival to Salude. We strive to work through this process as quickly as possible, especially when the patient is in need of pain medication. A staff member will be assigned to periodically check on you throughout the duration of your stay, ensuring that your concerns are addressed, and most of all, to make your experience a near perfect one. Please openly share your experience with your Salude navigator so that all of your needs can be addressed in a timely manner. Each day you will have the option of choosing our Chef’s Daily Special or one of our alternative menu items along with your choice from our assortment of drink options. The dining services staff at Salude would also like your family and guests to be able to enjoy our delicious meals. Guest trays include the Chef’s Daily Special only. Salude also has a Grab N’ Go Café, where you and your visitors can conveniently buy snacks and drinks. 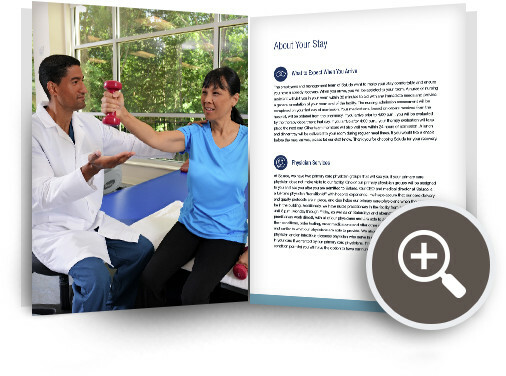 At Salude, we believe that recovery is based on multiple dimensions— social, occupational, emotional, physical, intellectual, environmental and spiritual— that’s why we offer the EnerG® program created by Aegis Therapies® to support the factors that impact patient health on a daily basis. The EnerG® program offers fun, interactive wellness activities and active participation classes designed to keep our patients motivated and moving while increasing their ability to be independent longer. Patients experience multiple educational opportunities, including guest speakers, study groups and mini courses on subjects, such as nutrition for seniors, cognitive enhancement, heart healthy choices, exercise benefits, accessing programs available in your community and many more. We encourage patients to let us know what they want to learn. A series of 18 classes, each with weekly “homework,” that can get seniors on the path to healthy eating and a healthy lifestyle. Classes are also beneficial as a one time healthy eating learning experience. Mounting research shows that mental stimulation and play is critical to a person’s mental health. You can participate in a group setting or individually if you prefer. The classes can be treated as a series of 10 weekly or bi-weekly and are also beneficial as a one time learning experience. Gentle, seated yoga exercises designed for seniors. The classes include posture instruction, breathing techniques, upper body asanas and stretches, followed by a brief hydration and cool down, then lower body stretches and education about relaxation and mindfulness. Interactive video sports, such as bowling, tennis and darts in a fun social setting. Located in our Multipurpose Room on the second floor, our cyber café offers classes on Internet and social networking, word processing programs, games and other computer-related interests. The instructor can also help you to look up anything on the internet that may interest you. Our Multipurpose Room is full of interesting things besides our computers, such as games and art supplies. We also offer the convenience of Cine-de-Salude— an on-demand television program showcasing the latest movie releases readily available at your fingertips.